Before I met you, I dreamed about you. I imagined myself with a supportive husband and darling, well-behaved children. I imagined the space would perfectly fit our personalities and our needs. I imagined a lush, beautiful property for my family to play on and a white picket fence to keep all our goodness in. So when we met the realtor on your cracked steps and noticed paint peeling off the house, I tried to keep an open mind. When I noticed the stained floors, dated kitchen, retro bathroom and astro-turf covered backyard, I shuddered. You were more work than I bargained for. You were more work than I had time for, or more importantly, money for. It's not that I didn't have a good imagination. I could see that the space of the house would fit our needs. But with a toddler and another baby on the way, I simply wasn't willing to take on so much work at once. Unfortunately, we were running out of options in a hot property market. We had lost 4 homes in bidding wars and the rentals we'd seen wouldn't fit our needs for more than a few months. We were faced with the option to bid on this very imperfect house, or rent an even less perfect one. Tom and I took a step back and evaluated the house's redeeming qualities; it was in a fantastic school district, it was just over a mile to our village downtown (with access to a train downtown, library, and local restaurants), it had an unexpected fifth bedroom, it was triple the space we'd ever had in a rental, the three-seasons room off the family room was cozy and charming. We made an offer. Fifth time must have been a charm because we got the house. It was the first house we ever owned, but that delightful euphoria of owning a piece of the American dream was stripped away when we built a to-do list. It seemed like it was miles long! Brick patio in place of astro-turf, gut the kitchen, update three bathrooms, remodel the master suite, replace the downstairs floors, refinish the upstairs floors, new windows, replace doors and trim, paint exterior, add landscaping, fix the laundry list of problems revealed during inspection.... it felt like we'd never accomplish even half the list before our 30 year mortgage was paid off. Me and Maddie standing outside our new house on closing day. The day we closed we went straight to work - my newly acquired baby bump barely noticeable as we ripped out carpets to reveal wood floors, took down shower doors, tore off bathroom countertops, and deep-cleaned every nook and cranny. It didn't take a visit to our accountant for us to know we couldn't afford all the renovations up front. So we prioritized based on what would be easiest to have done before we moved in and what could wait a few months. We decided to have the freshly-revealed but battered wood floors upstairs refinished and paint the whole house interior. We had a serious storage problem on the main floor, so I found a carpenter to build a mudroom locker bank with closet in our family room, which was located off the garage and currently being used as a playroom. 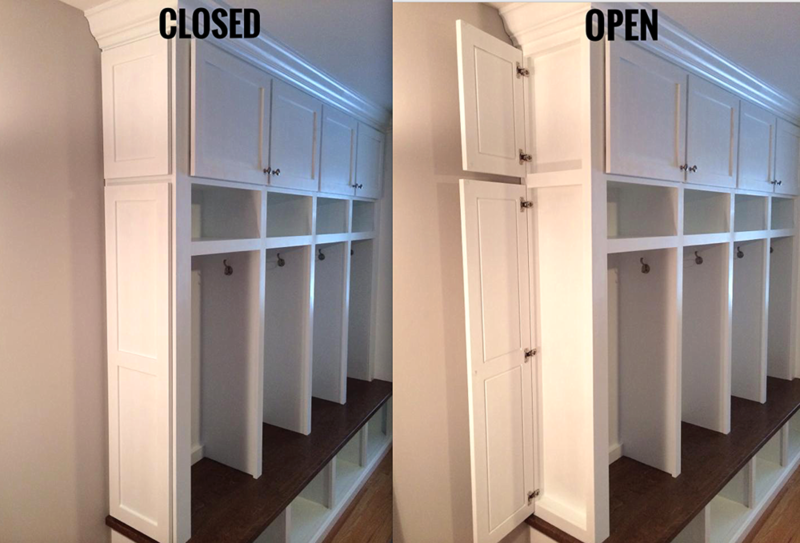 We had a serious storage problem on the main floor, so we added this bank of built-ins with a cubby for everyone and a large closet with shelving for art supplies and hanging space for coats. My favorite part about the lockers was the hidden side-panel. It housed our key hook and a message board. After these projects were complete, we had to stock away some savings before tackling the next round of professional jobs. In the meantime, I kept myself busy furnishing the house and with DIY projects. It's amazing the difference that swapping light fixtures can make. We focused the bulk of our small lighting budget on the kitchen and playroom fixtures, then used the remainder on inexpensive bathroom fixtures with the intention of updating again a few years down the road. I refinished the upstairs bathroom vanities using Java Gel Stain and we later added new countertops and faucets. I didn't have the foresight to take a great "before" photo so this one is from the listing. The kid's bathroom refresh was completed for less than $400 (quartz countertop, faucet, stain, mirror, light fixture, shower curtain, and bathroom hardware) and a whole lot of elbow grease. We used the same materials in the guest room ensuite bathroom for bulk discount on the quartz and to keep a consistent feel upstairs. I was tired of looking at our traditional fireplace - it just wasn't our style! I decided to make it a little more modern with a few coats of paint. It was my first time using Annie Sloan chalk paint and wax which was perfect for this project. It also was the start of my love affair with my Annie Sloan round brush which is a must-have for any project with grooves. It's pricey but it's proved it's value and saved me time on countless projects since I made the investment. I wish I had counted how many people told me that painting the fireplace would "ruin it." I'm so happy I didn't listen because I loved it and the result complemented our decor so much better. Fireplace makeover with Annie Sloan chalk paint - no sanding was required, but I did a little for a perfectly smooth finish. 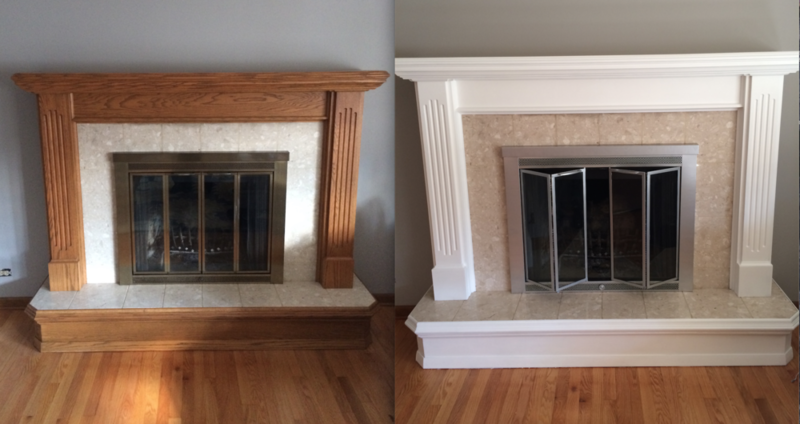 I completed this project in the winter, but my intention was to re-do the fireplace insert with an oil-rubbed bronze high heat spray paint. I never quite got around to that project! Soon after the fireplace was complete, I started to go in baby-nesting mode. Our daughter had never had her own room in our tiny San Francisco apartment, and I was determined to make her a glam room on a budget. It started with a Moroccan wall stencil by Cutting Edge Stencils. Painting this Moroccan pattern was easy with the stencil I bought from Cutting Edge Stencils. I wanted something that was neutral, but fun, and it was important that it be able to grow with her because I do not love painting! I found a Dania dresser and nightstand on Craigslist for $200. They were in great shape and had the exact look I was looking for. I glammed them up with some Rustoleum metallic paint and crystal knobs I found off Amazon. I'm always so eager to get a project started that I forget to take before photos. Luckily Dania still sells this set so I was able to grab some stock images. I finished these dressers just in time! About a week later, baby Jack was born and we took a much-needed breather from the projects around the house, fixing only what was actually broken.